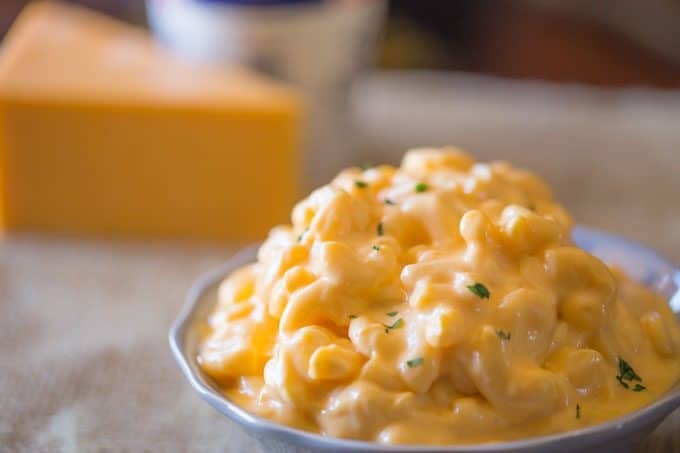 Super Creamy Macaroni and Cheese has always been a battle when it comes to working without processed/American cheese and this dish finally gets it right without compromising the creaminess. As a private chef you get clients who will say things to you like “I want this to taste like a box mix or boxed mac and cheese but I want it all organic” and you’re left scratching your head wondering how to turn all those foods into the perfect food memory without the actual ingredients used. This Super Creamy Macaroni and Cheese is the brainchild of one of my client’s requests. 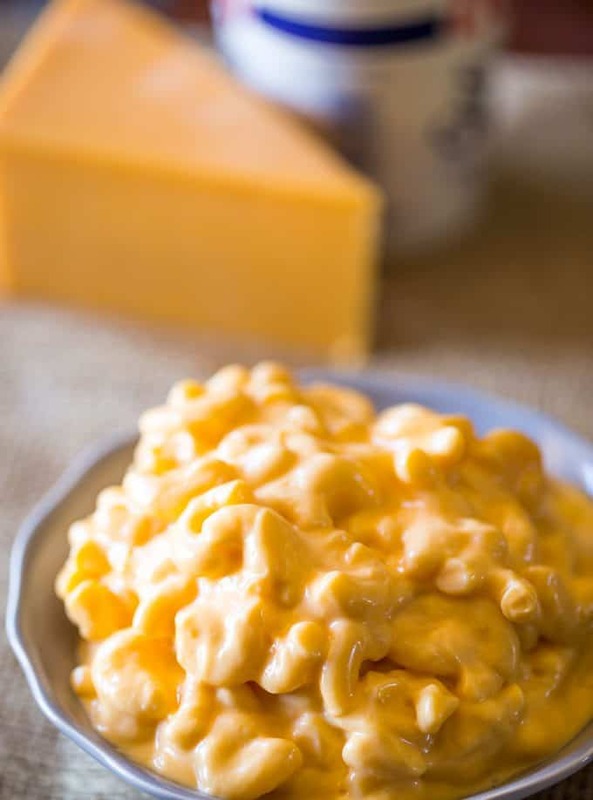 I started with a search for creamy macaroni and cheese that didn’t use any Velveeta or American cheese and started experimenting. The original calls for baking which totally lowers the creamy texture (but it does add an awesome crust) so I altered a bunch of things over the course of many cooking trials until I found something that looked like the creaminess you’d expect but without the use of the easy melting processed cheese products. The important thing to keep a note of when it comes to keeping this recipe creamy is FAT. I know how much you would love it if I could tell you all that this recipe is a healthier creamy option. I can’t because science won’t allow me to keep the creaminess with natural products unless fat comes into play. So no low-fat products here, if you use them it will alter the texture. Whole milk and half and half (I originally used heavy cream but found the difference in creaminess to be minimal while the cost and calorie savings were much more than minimal) are hugely important here. 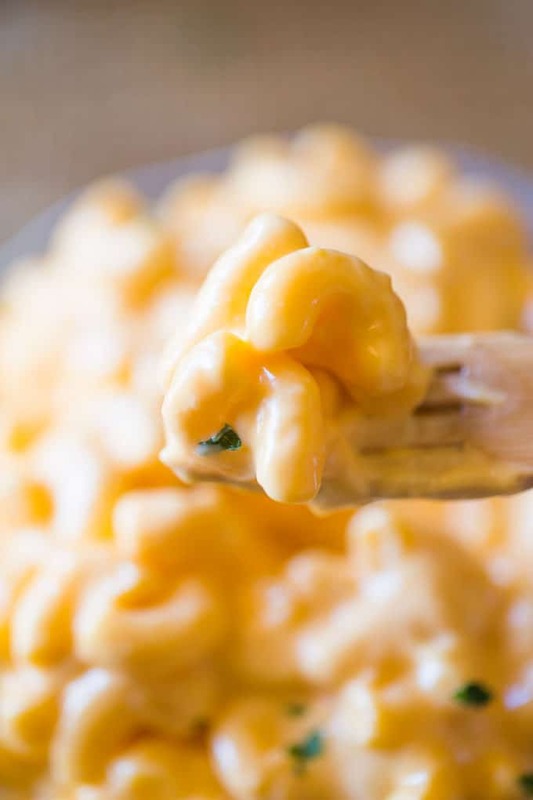 The milk is carrying this Super Creamy Macaroni and Cheese on it’s back and absorbing the starch of the pasta as well as the minimal amounts of spices that are added. If you are sodium sensitive feel free to halve or omit the salt, I am going for rich, indulgent Super Creamy Macaroni and Cheese and that means a full bodied flavor. I have had clients who were averse to salt have me make this for them and the natural sodium in the dairy was plenty for them. If the idea of a slightly less creamy, but amazing crust option sounds good to you, add it all to a baking dish, cover with an additional half cup of cheddar cheese and bake for 15-18 minutes. The original recipe calls for uncooked pasta baked for 30 minutes, but in my trials I lost most of the creaminess doing that. Blendtec Blender: This is the blender I use for everything (I bought it reconditioned but it only had 4 cycles before me) and it is a total workhorse. Everything is creamy coming out of it. If you have a blender that gives you super creamy smoothies then skip this, if you have one that leaves things a bit grainy, then let the blender keep working longer until you get your ingredients as creamy as possible. Pasta Pot Strainer: I try to shy away from a ton of single use products, but this strainer makes life so much easier. Instead of washing a colander and then returning the pasta to the pan or using a pasta pot, I add this to the side and strain in the pot. It’s small and super easy to wash and I use it for all things I need to drain except very small shaped pastas/grains. In a blender add the cottage cheese, half and half, dry mustard, cayenne, nutmeg and salt and pepper together until the mixture is completely smooth (even if you think it is smooth, give it an extra 15 seconds, you want it smooth or your pasta will taste grainy). In a large pot (the one you drained the pasta in, don't rinse the pan before adding the ingredients), add the butter, cheddar cheese, milk and pasta. Stir together until the butter is fully melted, then add in the cottage cheese mixture. On a very low heat simmer the pasta a few minutes (I would say no more than 5) until it is as thick and creamy as you like, then serve immediately. Leftovers won't be as creamy since the pasta will soak up liquids as it sits. Just made it and it was delicious! I heated up the cheese sauce nice and slow then turned up the heat a tad as it looked a little soupy. I added the cooked noodles once I thought the cheese sauce was a good consistency. As I let my bowl cool a little, the cheese sauce thickened up perfectly! My son commented that this is better than the roux version. Thank you very much for sharing this recipe!!! I had the same problem with the over liquidity nature. One step that may need clarification is if you boil the pasta ahead of time. I had to assume to boil it and drain it. I followed the recipe exactly and cook all the time. It was the perfect consistency until I added the cottage cheese and half and half mixture. Possibly drain the cottage cheese? I’ve tested this many times with no issue. Sounds like maybe you needed to let it cook a bit longer to thicken up. Hope this helps for next time. My first time making Mac and cheese. Totally messed up and added the milk to the cottage cheese mix. Then I had preshredded cheese and saw they had added potato starch to stop it from sticking, so I washed the cheese. ? I had some Velveeta so when I mixed it all it came out SUPER. Great recipe! So glad you were able to save it! Thanks for coming back to let me know how much you enjoyed it. Made this and it’s the best homemade Mac n cheese I’ve personally ever made. My family thought it was tasty. Thanks for the recipe. Definitely make again. Well done!! Thanks for dropping by to let me know! I’m so glad you enjoyed it! 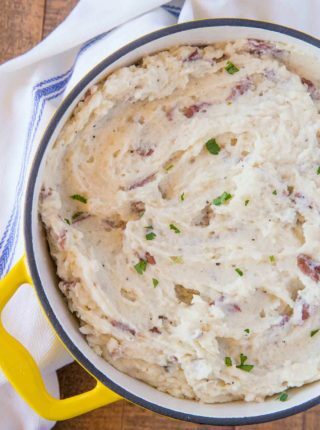 This was such a hit at thanksgiving and I’m looking forward to making it again for Xmas! SO easy 🙂 I love all your recipes, Sabrina, I’ve never made one that wasn’t a crowd pleaser. Happy Holidays! Thanks so much, Renee! Happy holidays to you too! Hi Sabrina! I’m thinking of making this for the kids to have an extra side on Thanksgiving. If I prepare it ahead with the cheese on top to reheat/bake in the oven, do you think that would work? I’m concerned about the sauce separating when reheated because I tend to experience that with creamy pastas. Let me know if you have any tips! Unfortunately, I’ve never been able to recreate or find a mac and cheese recipe that works with making it ahead. The noodles always end up soaking up all of the sauce and it comes out dry. Sorry. Just a question. I want to make this for thanksgiving dinner. How long will it stay creamy? I don’t want to take it to my brothers house and have it end up being hard. I wouldn’t let it sit for too long because the longer it sits the more the noodles will soak up the liquid. Make sure to give it a good stir before serving. 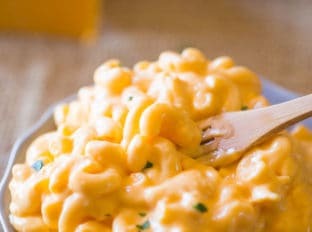 I like very creamy macaroni and cheese. Recently I read the key is making on stove top and not baking it. Can I use your recipe but make on the stovetop? This is a stove top version. Enjoy! I just made this tonight for a family our family of 5. As others mentioned, mine came out soupy. I stirred in the milk very slowly and simmered for 5 minutes. I really liked the flavor and the soupy thing wasnt a big deal and something I think I can fix next time by adding less milk. The thing that bothered me was that it still tasted grainy. I have an awesome blender and the cottage cheese mixture was completely smooth so I think the graininess came from the cheese mixture. I hand grated the cheese, it wasnt pre grated. Bummer. With that being said, it was still really good and I appreciate the recipe! This sounds delicious. How would you recommend adjusting this so that I can make it in a larger quantity for a holiday party? In the recipe box, you are able to adjust the serving size up or down to fit your needs. It’ll adjust the ingredients for you as well. Hope this helps! Total failure! Its like the cheese disappeared and left soup behind. I think Ill try a recipe for cheese sauce that is complete before adding to the noodles. So sorry to hear that it didn’t work out for you. You can always email me at contact @ dinnerthendessert .com and we can troubleshoot and see what went wrong. I just finished making this for the second time to improve on the first time.FIRST TIME: I prepared per instructions up until the “On a very low heat simmer the pasta a few minutes (I would say no more than 5) until it is as thick and creamy as you like, then serve immediately.”First, very low simmer did not work for me at all – had heat to Medium to get a simmer.Very deceiving to gauge thickness. Simmered at least 10 minutes to get consistency I wanted, then with noodles in so long, they became too soft. 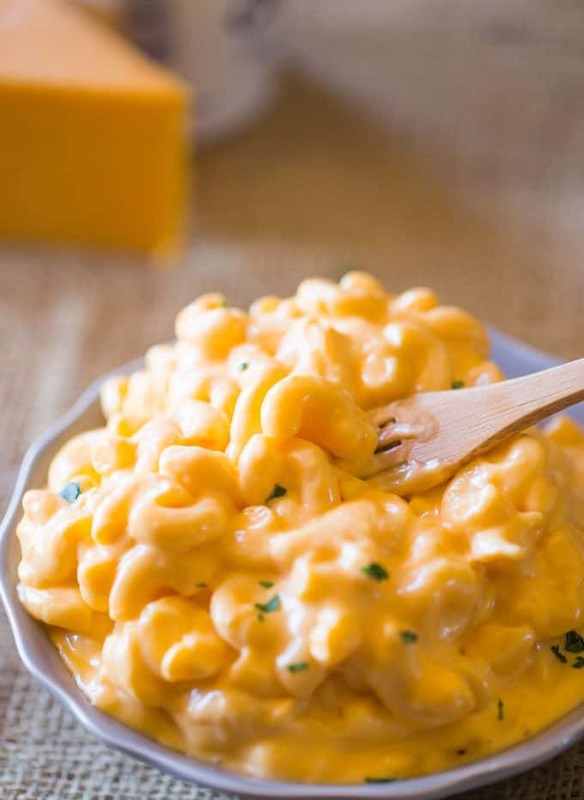 I’ve been searching high and low for a creamy mac ‘n cheese I can make in bulk and in advance. That’s predominantly how this first attempt was consumed – reheated in microwave and topped with some grated parmesan cheese. Perfect for packed lunch or quick snack.Note on recipe: 1) does not specifically say to shred cheese 2) the “pinches” of cayenne and nutmeg I first used were too small to even taste (I prefer measurements)SECOND TIME: I doubled the recipe (again primarily for reheating). I increased the size of my “pinches” – probably about 1/4 teaspoon and used 3 pinches instead of 2. [If I make again as double batch I would use 3x cayenne and 2x nutmeg]SIGNIFICANT CHANGE TO PREP to try to manage thickness and not overcook pasta:I DID NOT add pasta to cheese mixture initially. Still did cheese sauce in two steps (melting butter, cheese, milk) then added cottage cheese mixture. Simmered on Medium for about 10 minutes. Turned off heat (gas stove) then folded in cooked macaroni. Much better outcome to serve as warm than first attempt (still like adding the grated parmesan for texture and taste). Confident it will reheat well, too, as the last batch did.My one negative on the recipe is the amount of clean up with various tools needed for prep (also why I doubled the batch – too much effort/clean-up for one batch).Worth the effort for a make-ahead bulk comfort food, side dish or quick hunger-satisfying snack. I cooked this recipe with your suggestions…It was yummy but still couldn’t get it to thicken up without adding a TBS of corn starch. Made this for dinner. It was a super hit with my family. Thank you for the recipe! 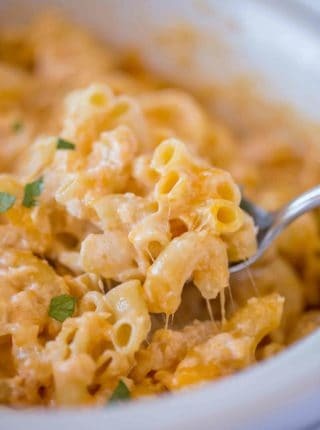 My husband loves macaroni and cheese but other from scratch recipes I tried where not nearly as creamy. I love that it is free of processed ingredients. Definitely will be making this again when I want to show my hubby some love via food ? 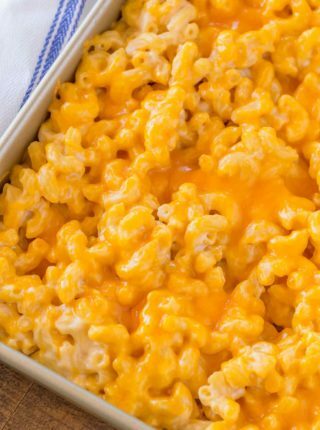 My kids loved this and they’re very picky with Mac and cheese! I was on the phone so I made some mistakes but they turned out well 🙂 I accidently added heavy whipping cream instead of half and half. I didn’t have dry mustard so I left that out. I forgot to add the milk and it ended up turning out perfectly for our tastes. Thank you so much! I had the same issue as some previous comments mention of it turning out like soup! I shaved 1 head of broccoli to make it broccoli mac and it looks like broccoli noodle soup. Next time I would modify and use 1/2c of half & half and 1/2c of milk. Other than having to eat it like soup the flavor is delicious!! I was surprised at how how great a flavor the cottage cheese mixture gave it. Just made this and tasted delicious, but you most certainly need to simmer…full simmer on low heat (took a while to get to this point) after adding milk and cottage cheese mix. Then simmer at least 5 minutes.. mine was finally thick and creamy…. low and slow ? make sure you grate the cheese! i just cut it up and it took ages to melt. super tasty though! This recipe is excellent! I’ve made it 3x now and each time I change up the cheeses to get different flavors. The favorite thus far has been Colby jack, medium cheddar, and sharp cheddar. My family LOVES this. I think maybe everyone is eating the Mac and cheese too fast or something. Because mine is never runny or soup like. Other than the cheese I follow the recipe to the letter. Thanks for a wonderful dish! My cheese didn’t cream in like I thought it would. I didn’t use pre graded cheese either. Any suggestions? So sorry it didn’t cream up as expected. My suggestion would be to add the milk very slowly next time and whisk it really well. Also add the cheese in a little bit at a time to ensure it stays a creamy mixture. Hope this helps! I made this recipe, and I don’t know what I did wrong either, but similarly to other users who have tried to make this recipe, the cheese part of the macaroni and cheese came out really soupy, curdled, and gross. I was trying to find a good alternative to roux that doesn’t use flour, but this recipe is not it. If you decide to try again, try pouring in the milk very slowly and whisk it really well. Also adding the cheese, little by little at a time might help with it staying smooth. So sorry it didn’t turn out the first try. Can you sub out the cottage cheese with a different cheese? What did you have in mind? I suppose you could use a ricotta? Cream cheese would change the taste a bit more than I would like. I made this for Christmas and had the same problem that Jennifer commented about: it never thickened up. Are you sure you make it with only 8 oz. of macaroni. I added 8 additional ounces of macaroni and it was perfect. It was delicious and reheated well too. Yes! I actually made the recipe again this weekend and added in more and more of the pasta and at the whole pound it was still creamy and delicious. I updated the recipe, thanks so much for commenting on it too! You’ll find it in the dairy or cream section (usually by the milk). It’s a simple blend of equal parts whole milk and light cream. It’s heavier than milk but lighter than a cream. Maybe I just did it wrong, but there was way too much milk. How long did you let it cook? You can let it thicken to your tastes as it cooks. Sorry this comment took so long to get to, it ended up in my spam filter somehow! Like a full on soup? Can you email me to trouble shoot? I’ve never had it be anywhere that liquidy. You certainly simmer until it thicken a bit but it should at no point look too soupy. Are the directions incomplete? When do you add the blended cottage cheese mixture to the pasta? Thank you! yikes! It is updated now, thank you so much for pointing that out. I even read the directions multiple times on different days to make sure they make sense and somehow that escaped me. I think I need to go back to having my husband review the directions. He doesn’t cook so if anything doesn’t make 100% perfect sense it hits him right away! Loving this version. For sure it looks super creamy and superb. This looks super rich and creamy. The ultimate comfort food! Holy moly, that does look super creamy and I’m drooling over this! I’ve never added cottage cheese to it before, what a great idea! I can’t get over how creamy this looks! 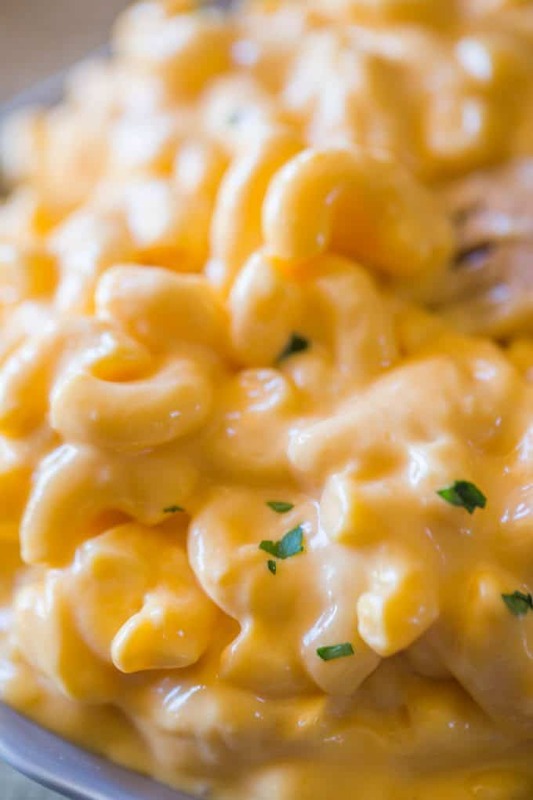 I love that you used cottage cheese in this mac ‘n cheese! I would have never thought of that, but it sounds incredible! Seriously. YUM. I cannot wait to make this for my family! Cheesy comfort doesn’t get much better than this! It’s crazy how some people want food that tastes like it came from a box! 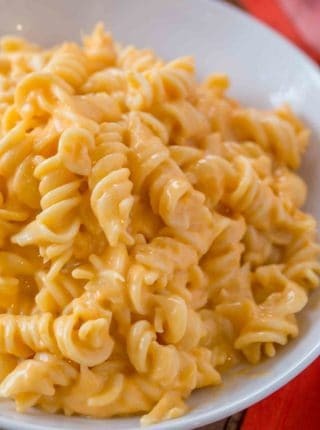 This mac and cheese though…I want a bowl full of this! Hi Amy, It’s not that we want it to tasye like it’s from a box. 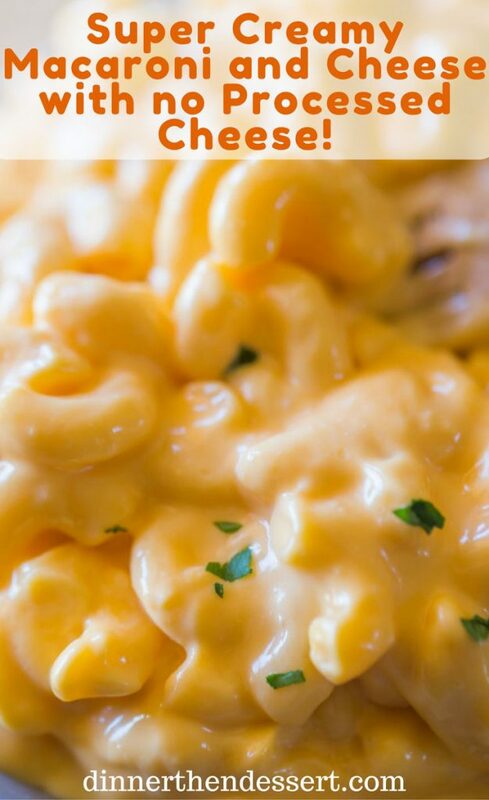 I have this same issue, sometimes I don’t want baked Mac n Cheese… I want a creamy cheesy Mac n cheese, kind of saucy. The best way to describe it is the box mix.